[A]lmost four decades after the Club of Rome raised the issue of "the limits to growth," the economic growth idol of modern society is once again facing a formidable challenge. 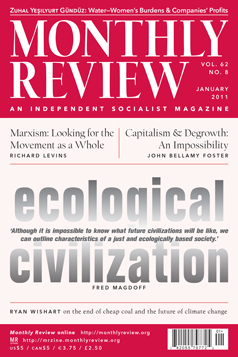 What is known as "degrowth economics," associated with the work of Serge Latouche in particular, emerged as a major European intellectual movement in 2008 with the historic conference in Paris on "Economic De-Growth for Ecological Sustainability and Social Equity," and has since inspired a revival of radical Green thought, as epitomized by the 2010 "Degrowth Declaration" in Barcelona.… Ironically, the meteoric rise of degrowth (décroissance in French) as a concept has coincided over the last three years with the reappearance of economic crisis and stagnation on a scale not seen since the 1930s. The degrowth concept therefore forces us to confront the questions: Is degrowth feasible in a capitalist grow-or-die society—and if not, what does this say about the transition to a new society?